Right before I started this blog, and my path to the CCIE, I was a newly minted CCNP looking for my next step. At the time I had thought that I wanted to go after a CCSP in the short term, with a CCIE after that. Well, life doesn't always work out the way you think it will. Instead of this path I ended up being head-hunted by my current employer who was looking to make me a CCIE. Great story eh? What does this have to do with you? I'm glad you asked. 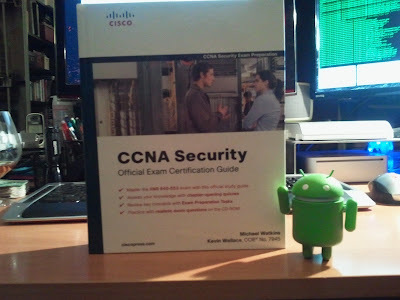 In preparation to go after the CCSP I bought myself a copy of the CCNA Security Official Exam Cert Guide (IINS 640-553). I've never read it. I've barely ever opened it. The CD in the back is still sealed. And it's extremely unlikely that I'm ever going to read it. So I'd like you to have it. It's my book. I'll give it to whoever I want. End of discussion. I'll pay shipping to you. I'll choose whatever shipping I like. I request that you follow up and let me know when you pass your CCNA Security exam, and agree to allow me to make a blog post celebrating the event. The winner must supply me with a real name and address. No PO Boxes. I will not publish any of your personal information on this blog or anywhere else without your express permission. This includes even your name if you do not wish it to be known. Everything is subject to change whenever and however I feel like it (Except the personal info bit). If you don't like any of this then don't bother emailing me. If you do email to complain I will delete your email. Deadline for entries will be midnight Mountain time June 30th. What am I looking for in an email? I have no idea. Surprise me. If there's any questions please use the comments so others can see them and the answers. Please feel free to tell your friends. The more the merrier! So far I have exactly zero (0) entries. I do realize that no one reads this blog so I wasn't expecting a torrent of emails... But I was kind of expecting at least one. So in the interest of not hurting my feelings how about someone send me an email and tell me why I should send them this book! A little over 72 hours left to get your submission in! I have received a few now, so there is some competition... But I promise I haven't made any decision yet and it's still anyone's game. Get your submission in today! this world is so ungrateful ! They do not want a free book !!!??? I looked up your blog because you answered a question of mine on a forum. And it was a good answer too! So I thought: "this guy/girl must have a few interesting network-related things on his blog !". That is how I landed here. I am not yet CCNA to be frank. But I have been asked to give basic courses in Networking to internal staff. I have already delivered the course to 15 people in all and I have been asked to give an intermediate level course next. I am seizing this opportunity to improve my knowledge in networking. Since the course is more or less CCNA level, I am trying to learn a bit higher than that. And your book will surely help me! I actually would like to take the CCNP exams directly without doing the CCNA ! About why you would want to give me the book, errrr....frankly! I don't know !!! Why would you want to give a book to someone who lives on the other side of the planet !!!??? And whom you do not know !? May be because I would make good use of it and other people will benefit too ! I will check your site periodically. Just reply to my comment if you think this wretch is worth your maginificent book, Oh Sahib !!! This poor speck of the creation will then let you know his true identity ! You may call be zoo..., short for zoobilizoo ! Thanks, but the contest closed 11 days ago. And you were supposed to submit via email. I am hoping I get the chance to do this again some time; keep watching. Keep going dude and keep us updated! The only books I have now that I'm willing to give away aren't current anymore. Hopefully something comes my way and I can do this again. We'll also see if the winner of this book actually uses it. That may make me leery of doing it again if this doesn't go over right. At any rate, I do hope I get the chance to do it again.